I took this picture through the window of the ferry as we sailed out of the harbour on our Summer holiday. 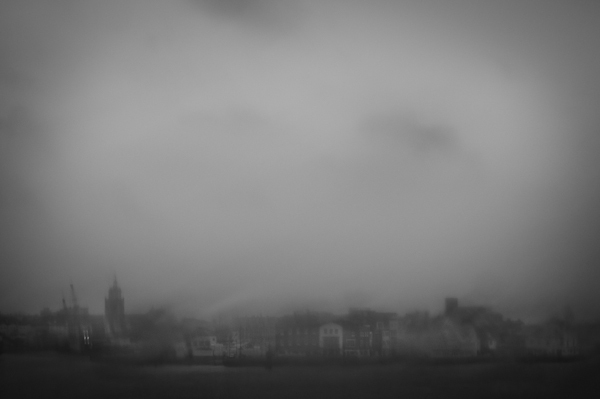 It was so gloomy but I liked the flat greys and the view of the seafront through the rainy window. I used to travel over from Gosport to Portsmouth for 5 years as I went to school there so the views always remind me of those times. They weren’t at all gloomy, but weather is weather and there’s no point trying to hide it. I love the atmosphere of this, Karl. The dampness had seeped into the picture and I like how things are a bit tilted and distorted. thanks, that’s really how it felt on the boat in the early morning rain!